Anyone with young kids will tell you that jokes, especially bee jokes, are always in season. So, when 12-year old Mikaila Ulmer, CEO of Me and the Bees Lemonade, opened her speech with a joke about sushi and bees, I knew it was going to be a good day. On November 5, 2016, SFC hosted the first family-friendly beekeeping class, and it was a sold-out event. Kids ages 5 – 12 and their family members came out to the SFC Teaching Garden to get up close and personal with the bees in the apiary. Gathered under the pavilions and hoping that the rain would stay away, the small group of participants seemed a little unsure and nervous at first. Mikaila had some tough ice to break. She told the group about how she started her lemonade business when she was only 4 years old after getting stung by bees twice. The bee stings scared her but also fascinated her, as I think all first bee stings do. At the time, her family was encouraging her to submit a product for an upcoming children’s business competition. She had also received a gift from her Great Granny Helen: a cookbook with a recipe for flaxseed lemonade. As her fascination with bees grew, she began learning more about their important role as pollinators in our ecosystem. She got an idea to create lemonade with flaxseed and use honey as a sweetener instead of artificial sweeteners. She would make a healthier product, support local beekeepers, and spread the word about the plight of honeybees. The business took flight. In the past couple of years, she has secured a deal on Shark Tank, landed a contract with Whole Foods Market and has been a guest on Good Morning America. Not too shab-bee! Back under the pavilion, the kids were ready to learn about the ecology of bees and suit up to get near the hives. 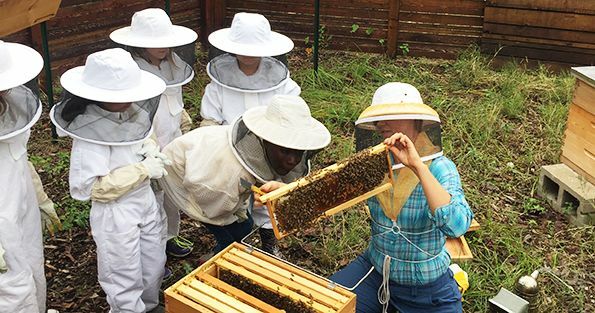 Tara Chapman of Two Hives Honey, who normally teaches adult beekeeping, sat down in the dirt and talked to the kids about different types of bees, their roles in the hive, and their connection to plant reproduction. When asked how old they think bees are, there were answers of, “four hundred years,” to “two thousand.” When Tara said, “one hundred and thirty million years old,” the kids and adults gasped. After a quick review of apiary safety, Tara brought out her smoker and hive tools. Two boys who were not going into the apiary worked on the smoker while everyone else suited up. At last, it was time to meet the bees. The kids were rapt with attention as Tara removed each frame, inspected it, and pointed out unique qualities of the hive. Interestingly, no drone bees were found. The kids and Tara hypothesized that since the winter months were coming and the mating job of the drones was done, the drones had been ‘kicked out’ to save precious resources inside the hive for the females, which is a common occurrence. The queen was spotted, which is always a treat, and the kids got to hold a frame to feel the weight of the comb and honey, which made for excellent photo ops by the parents. Needing to move quickly, as hives shouldn’t remain open for too long, Tara gently put the frames back in and asked for the tiny, wooden spoons she had brought. One of the kids fumbled around in their pocket with their huge protective gloves on and pulled out the bag of spoons. Carefully, Tara scooped out some honey on to each spoon, and after the veils were removed outside of the apiary, each kid got to taste that sweet, sweet honey that we all love so much. This being our first kid-specific beekeeping class, I didn’t quite know what to expect. As a novice beekeeping student myself, I even feel a little nervous inside a weird, sweaty bee suit with buzzing bees close by. I couldn’t have been more impressed with the class. The kids were safe, attentive, and truly interested in what Tara was saying and what the bees were doing. Of course, this subject is fascinating, and the promise of honey always helps. Teaching children about the importance of honeybees in the pollination of food crops is crucial to the future of agriculture and in turn, humans. I left feeling confident that our future generation of conservationists and business owners are on the right path. And, here’s the joke that Mikaila told at the beginning of the event. Pass it along to a ten year old. I think they will appreciate it. Q: What does the sushi say to the bee? A: Wasabee!